NoBS Batteries "What's the Difference?" On this page you'll find the NoBS answers to our most frequently asked questions regarding the Care and Feeding of NiMH and NiCad technology types and system applications. And, there's more.. we're proud to host Red's Battery Clinic , be sure to stop there for additional info, charger reviews and 'How To's' in depth. For Info on A123 Systems, General Care & Feeding and Operational considerations, see our A123 FAQ for R/C Giants page. For info on A123 on-board setups, connectors, charger and cabling considerations, see our A123 Setup Guide ..
Q: What's the big deal about 'Impedance'? What is it and what does it do? A: Most folks react to the 'capacity' rating alone as being the biggest part of their decision in selecting a pack for their big aggressive birds. This can lead to big trouble on board the aircraft. Just as cells are evaluated for capacity, in high load applications you need to take into consideration what the cells voltage performance will be when loads are applied. All battery technologies react to servo loads with a voltage drop while the load is applied. It's really very simple.. the higher the cells impedance rating, the greater the voltage drop will be while servo loads are applied. Rule of Thumb for cell selection: Impedance Ratings are like a Golf Score. The lower, the better. Aircraft in agressive aerobatic environments employing digital or high torque servos should carry a cell impedance score of 10 mOhms or less. As an example, one of the most popular lightweight packs used in IMAC aircraft is the Sanyo HR 2700AUX.. plenty of capacity, but the impedance rate on the cell is 20 mOhms. Pretty high.. but if it's used in parallel with another 2700 pack the impedance rate is cut in half to 10 mOhms (and the available capacity is doubled). This is why you usually see this pack employed in parallel in IMAC birds and used without issues as a single pack in a giant Cub. Q: Can I use my (insert the name/model of your charger/cycler here) to charge my new packs? A: I get this one via email an awful lot... the answer is always the same: "Every charger mfg ships their chargers with a manual... in that manual will be the operating parameters and what type (Nicad, NiMH, Lithium, Gell/Lead Acid, etc) the charger is designed to charge. Folks.. I build battery packs.. I don't do brain rentals and I'm surely not the planet's charger manual librarian... and you absolutely have got to do your own 'homework' regarding how to use your charger. If you don't have a manual for your charger and you made it this far, you can certainly figure out how to use a web browser/search engine to locate either a RCU or magazine review or the charger mfg's website for technical info on their product. So, Read The Freaking Manual to learn how to use it, and how to set the charger up for the type of battery you intend to charge. Then check the battery pack label. On our pack labels you'll find the cell technology type and the recommended charge rates for both fast and slow/formation charging. Q: What's up with 'Formation Charging'? Can't I just charge and fly a new pack? A: The term 'Formation Charging' describes the initial charge/discharge 'forming' process that fully activates the 'chemical engine' and balances the cells in a new pack. NiMH packs have a particular need for repetitive c/10 charge/cycle conditioning, a 'break-in' procedure needed to get them to full rated capacity. Both NiMH and Nicad packs benefit from the process and the intent is to make sure that any new pack has been verified to be fully operational and that a 'start-up' capacity number is established for the pack before it's put into service. To 'Form' a new NiMH pack do three 10% 16-24 hour charges followed by a 300 to 500 ma discharge routine between each charge. In other words: Do a slow charge at the slow charge rate (or as close to it as you can reasonably get with your equipment) as shown on the pack label. Charge till the pack is warm, followed by a controlled discharge with a cycler. Do it 3 times. The recommended Formation Charge/ Slow Charge rate for our packs is printed right on the label of the pack as well as on the data card the pack was shipped with. New Nicad packs should get at least one slow charge followed by a 300 to 500ma discharge. Record the capacity numbers reported by your equipment for comparison cycling as the pack ages. Never check your brain at the door! As one respected modeler put it, "There's nothing more suspect than a new battery pack." Before you fly anybody's pack be certain it's fully operational and safe to fly. Q: I have a programmable charger/cycler. What discharge rate and voltage cutoff value should I use for the Formation Process and capacity checks? A: Most programmable charger/cyclers allow programming the discharge current and the low voltage cutoff level for the discharge. If using a 250-300ma (.3) discharge rate set the cutoff voltage value at 1.0v per cell. If using a 500ma (.5) discharge rate set it at .8v per cell. For formation charge/discharge routines and capacity checks on Rx and Tx packs we don't recommend using a discharge rate higher than 500ma (.5) and DON'T discharge under any circumstances below .8v per cell !! Packs with cell impedance ratings below 10 mOhms CAN de discharged at 1.0 amps AFTER going through the formation process.. BUT NOT BEFORE. Q: My charger will only set in 100ma (.1) increments. I have a 1500ma pack. Should I use the 100ma setting or the 200ma setting for slow charging? A: I normally 'round down' for forming and slow charging. Most programmable chargers will still be using a 'peak detection' circuit to monitor voltage; however caution should be used.. at low charge rates with some chargers, peak detection is sometimes unreliable. You may also need to disable the chargers auto timer shutoff feature if it has one. As always, temperature is key.. when the pack gets comfortably warm, regardless of the charge rate chosen (rounding down or up), stop the charge. There's more info on the relevance of pack temperature a little further down in this FAQ. Q: What’s ‘cycling’ and why do I need to do it? A: Battery‘cycling’ in it’s simple form is the two step process of charging and then discharging the battery under controlled conditions. Normally the purpose of the procedure is to ‘condition’ or ‘format’ a new pack or to verify the capacity or check the condition of a pack that’s been in service. ‘Routine’ cycling, or discharging before recharging a pack after every use is not necessary for either NiMH or Nicad packs, and discharging to ‘zero’ voltage under load is in fact harmful. A ‘cycler’ or controlled discharger will limit the discharge voltage level to prevent damage to the pack, whereas ‘leaving the switch on’ in your radio system to discharge a pack is very poor practice and may result in damage your radio system components or the battery. Most ‘hobby’ cyclers or dischargers operate at a predetermined load and cutoff level that is different than the cell mfg’s rating system. This leads to discrepancies that can be a high as 10-15% of rated capacity between the mfg’s rating and the rating presented by the cycler or discharger you are using. If your cycler or discharger system’s numbers are lower than the comfort zone described above then you need to verify the calibration of the cycler and check the charge rate and charge time to insure the pack did indeed get a full charge before the discharge function began. If the numbers are still uncomfortably low after re-running the test with your new pack, we suggest you contact the assembler or retailer for evaluation assistance in determining what the cause is before using the pack in a critical application. Any pack cycling more than 25% below the mfg's rating or the original numbers established for the pack with your equipment when it was new should be removed from critical application service. Q: How do I know if my pack is fully charged? Temperature is the key.. always, always, always! IF THE PACK AIN'T WARM AT THE END OF THE CHARGE ROUTINE, IT AIN'T CHARGED! Note I said 'warm'. Not HOT! Hot is NEVER GOOD at the end of the charge routine.. but warm is OK. If using a temp probe, set it for 10 degrees above AMBIENT. If it's a peak controlled charger and the charger shuts down before the pack is slightly warm to the touch.. IT AIN'T FULLY CHARGED. If it's a timer controlled charger and at the end of the charge period the pack is not warm.. it's NOT fully charged yet! By far and away the biggest reason for low capacity numbers is undercharging.. if you have a 5 gallon pail with only 3 gallons in it, your only gonna get 3 gallons out of it. Engage your brain.. check temperature at the end of the charge routine! Q: Temperature?? I thought voltage was how you could tell the pack was charged?? A: More packs have been fried by guys looking for a 'number' instead of temperature on a charger than any other cause of premature battery failure. The 'finish' voltage of a pack will vary under an astounding number of variables.. but temperature rise ALWAYS signals that the cells are charged in a slow charge routine. Why? Because when the cells can no longer absorb the energy being shoved at them by the charger, they begin to give the unstored energy off as heat. Taking the Temperature story to the next level.. fast charging. Here we can generate even more heat. Some high-impedance cells like AA NiMH's can get warm when being charged at 'normal' 1C (fast) or even 10% (slow) rates. They can get warm BEFORE they get to full charge. Why? Because high-impedance cells don't absorb energy as efficiently at high current levels.. just like they don't give up energy efficiently at higher discharge rates. So.. before you crank up the current on your charger on your new NiMH Txpack.. check the pack label on our packs.. and set the charge rate recommended; which is often LESS than the 'industry standard' for NiMH cells. Final word on temperature: Aside from being a key indicator for correct charge time, rate and final charge condition bear in mind that heat is the bitter enemy of NiMH Cells. Drive the pack into thermal overload (hot) on the charger and it's likely you'll ruin it. Pay attention to the temperature! Q: If I decide to charge an eneloop pack in my Transmitter and I charge too long with the oem charger what will happen? A: You'll cook the pack, likely damage the Tx, possibly burn down your house and then try to tell me it's my fault because I didn't put adequate warnings on the label, (STOP CHARGE WHEN PACK WARMS UP apparently wasn't good enough) then threaten me with trashing my product and business on the Internet forums if I don't buy you all new gear. If this is you, do all of us a favor. Take up a different hobby and if you choose not to, please; buy your packs someplace else. *sigh* Don't ask why this question made it up here, suffice to say there are those among us that figure somebody else is always responsible for their knuckleheaded actions. And no, I'm not responsible for what the customers do to or with their battery packs. Q: How long should I wait between charging and discharging for capacity checks? A: I actually had a guy that sounded like he knew what he was doing run me through hoops for days regarding low cycle numbers on his new packs. Finally he dropped the little missive, "I've been waiting 24 hours after the charge to start the cycle...." ARRRGH! Where do folks come up with this stuff? Here's the deal.. ALL battery technologies have a self-discharge characteristic. NiMH self discharges at a higher rate than Nicad. Lithium has the lowest self-discharge rate.... but the point is, waiting a day (or an hour) to start a discharge after a charge will trend the capacity return downwards. Nominally, depending on cell type, age, impedance and temperature; a 10-15% capacity drop over 24 hours is not unusual. So.. whatever goofy procedure you use.. do it the same way each time, because if you change ANY parameter in a cycle test procedure you will effect a result in the returned capacity number. Time span between charge termination and discharge start impacts test results. Long leads impacts test results. Cycling through switch harnesses impacts test results. Cycle testing in cold or hot conditions impacts test results. Here, we cycle immediately after the charge completes. If your cycle a day later, your numbers won't even be close to mine.. or the cell MFG's. Same goes for long leads, cold days, running your cycler through system switches.. ENGAGE THE BRAIN... YOURS, NOT THE CHARGER / CYCLERS! Q: I have a 3300 NiMH pack I got from another vendor, and since there were no instructions, I never ‘formatted’ it. Have I damaged it? Will it hold a full charge now? A: ‘Forming’ on a new NiMH pack gently ‘teaches’ the little buckets of chemical soup (the battery industry calls them ‘cells’) that it’s in fact a ‘battery pack’. It brings all the cells up to full charge gently, and if any cells in the pack get to full charge before their brothers and sisters in the pack, those cells are much less likely to receive thermal damage. (‘Forming’ is also called ‘equalizing’ or ‘cell balancing’) The formation process ALSO garners capacity data on the new pack to use for comparison when evaluating the general condition of the pack as it ages. If your situation matches the criteria in the question above, by all means, run a ‘formation’ (slow charge) routine which will re-equalize and balance the cells in the pack and then cycling the freshly charged pack will get you your answers… if it reaches to within 10% of the mfg’s capacity numbers and passes the charge retention test, I’d say your pack is serviceable. Q: Enh? Charge Retention? What’s up with that? A: All stored energy systems (batteries) have a ‘self-discharge’ characteristic. This means that a ‘fully charged pack’ is in fact only ‘fully charged’ at the point it comes off the charger in a warm state. Cycling out the pack at that point gives you the nominal ‘capacity’ number for the fully charged pack. If you then re-charge the pack and disconnect it from all devices and let it sit for 2 days and THEN discharge it, it will cycle out with a capacity number up to about 25% below the nominal capacity. More than 25% capacity loss over 48 hours and its possible there’s a weak cell in the pack. Not all battery technologies have the same self-discharge characteristics. As an example, high impedance NiMH Tx packs self discharge at a more rapid rate than Nicads. This is why we always check the voltage display on out Tx’s when we turn them on and we check on- board packs with a load tester before the FIRST flight.. Why?? Well, you may have charged that pack last night… but is it safe to fly now?? Only a load check will reveal if the pack is indeed at a high enough charge state to safely fly it. Q: Is 'self discharge' an issue, if I charge on Friday but don't make it to the field till Sunday do I have a problem? Nope. Think about it for a minute. Do you fly without first checking your pack at the field with a load tester? If you do, THAT'S a problem. (scroll down for ESV info) I'd hope that anybody smart enough to buy good packs was also smart enough to have good field habits and would ALWAYS check the pack with a loaded ESV appropriate for the kind of pack and plane he's flying... before each and every flight; including the first one. We ALL stop flying when the loaded voltage displayed is lower than 1.2v per cell. AND, we all know the pack is 'officially' discharged as far as a capacity test is concerned at a much lower voltage than that (usually .8v per cell). That means we're never actually flying out the full capacity of the pack.. we stop and recharge or go home BEFORE we get to a dangerously low voltage level. So, using your brain this time; the answer is? Q: Do I need to ‘load test’ my Tx pack before flight? A: Just turning on the Tx ‘loads’ the pack with about a 250ma load, so an external load tester is not needed for Tx packs since the voltage displayed on your Tx is the loaded voltage of the pack. Below 9.5v, I’d charge. 9.6v and above.. your pack has more than enough of a charge to fly. Bear in mind that the cell mfg’s consider a cell is discharged when it reaches .8v per cell… in a Tx pack that’s 6.4v!!! Nobody in his right mind would fly a Tx pack down to that level, and most of you have Tx’s with low-voltage alarms built right in… they usually start hooting at you when the Tx pack gets under 8.5 volts… so relax, and stop beating the crap out of your Tx packs with a fast charger when you see less than 10v on the Tx voltage display. Q: My 2700 NiMH Txpack seems to self discharge pretty fast. After 3-4 weeks in the Tx the voltage of the pack is below a flyable level. Is there an easy way to keep the pack charged and ready to go? Q: My (insert your pet glorified battery toaster make and model number here) indicates my 3300ma pack only has 2200ma capacity at the end of the charge. Is something wrong with my battery? A: I have no clue with just that small piece of data to go on.. But; I’d suspect right off the bat that if that pack was warm at the end of the charge routine that the pack had some charge in it when the charger started in and that the MAH display on the charger is telling you that it put in 2200ma before it decided to stop. You DID remember to check the pack temp at the end of the charge, didn’t you?? Q: At the end of my 2700 Tx pack’s charge routine my charger said the capacity was 2965 ma? Is this possible? A: See the answer to the question above this one… again, the Charge MA display is NOT the packs capacity. To determine the amount of energy the pack has stored, you have to Cycle the pack.. That’s Capacity. The charger display just lets you know how much energy got pushed at the pack… not how much it stored. Q: My charger only ran for 12 minutes and shut off. What’s up? Is the pack charged? A: So, here goes; one more time, the basics: Temperature is the key to determining if the pack is fully charged. A pack that is not warm at the end of the charge routine is NOT fully charged. A pack that is not fully charged cannot return full capacity. ‘Smart’ chargers are anything but ‘smart’ in determining ‘what’s up’ since they cannot reason and evaluate ALL the info the charger exhibits. YOUR brain is the crucial element here.. so your next move is to check the pack temp. If the pack is warm at the end of a slow charge routine it indicates the cells can no longer absorb the energy being shoved at it by the charger and the cells are giving off the surplus energy as heat. Please note that should the charge rate be too high, the cells will warm up very quickly… since again; the cells cannot absorb all the energy being pushed at them at the too-high rate, hence the energy NOT reaching the cells is coming off as heat. This is why we publish both the max slow charge rate and max fast charge rate we recommend for that type of pack right on the pack label. If your battery supplier does not provide that basic info, then try using 10% of rated capacity for a slow charge rate and a maximum 1C rate for fast charging… AND CHECK THE TEMP OFTEN DURING THE CHARGE ROUTINE. Q: On your Eneloop 2000 & Sanyo 2700 AA Tx packs, the label says ‘Slow charge 150ma, Fast charge 1.0 amps max. Why so much less than the 10% and 1C rates? A: High Impedance, High Capacity AA NiMH cells are very fragile with regards to thermal damage. On our end we’ve learned to take significant steps to protect them from thermal damage even in the assembly process by utilizing lower weld temps. These ultra high capacity (and very high impedance) cells are indeed unique and delicate.. and that’s why you’ll never see us offer the Sanyo Eneloop or 2700 AA NiMH cell assembled as a receiver pack since they just can’t handle high servo current loads, high temps and high vibration associated with using them on board an aircraft. Since your Tx pack runs at well under a half amp constant current load, and it isn’t ‘up there’ being beat to death by high vibration, wild and erratic servo current loading and suffering with 130 degrees of heat under that big ‘ol canopy, the Eneloops & Sanyo 2700’s can do a fine job keeping your Tx going all day on a fresh charge. With regards to charging the 2000 & 2700 AA’s, even just a few minutes delay in shutdown at the full 1C (2.0 - 2.7 amp) charge rate can result in a fried pack. There’s just no room for error at the ‘industry standard’ 1C NiMH fast rates with these cells. Even at the industry standard 10% slow charge routines (200 or 270ma) a few extra hours of charge can force then into venting. Using the charge rates recommended on our pack labels will significantly reduce the chance of doing damage to the cells and they will definitely perform to spec longer if you stay with our recommended charge rates AND STOP THE CHARGE WHEN THE PACK WARMS UP. Q: My NiMH or NiCad pack is not warm, and the charger still keeps cutting off. Now what? A: Most ‘smart’ chargers employ some form of ‘peak detection’ circuit… this or cruddy charger cabling (leads too long or too light guage, worn connectors and plugs, etc) is usually the culprit. Replace your charger cords and on-board switches every few seasons and use decent quality field gear. If the pre-mature cutoff persists, (the pack is not warm) try charging the pack DIRECTLY instead of through the Tx charge port or the Rx pack charge port/switch. If cycling confirms that indeed, the charger has shut off early you can attempt to get around the chargers peak detection circuit by using a higher Mv cutoff point or by using a different charge sub-routine, like using the Nicad charge routine instead of NiMh routine (higher Mv cutoff). Again, as always, don’t check your brain at the door. Check the temp often and stop charging when the pack warms up… since your charger ‘detection’ circuitry is being by-passed in this work around, you become the control system. I suggest you check out Red’s Battery Clinic and eyball the charger reviews, he details how to turn most ‘smart’ chargers into constant current slow chargers for forming and timed slow charging routines without a confused peak detection circuit stepping in and shutting the charger down early. Bear in mind, again and as always, temp is the key.. when the pack warms up YOU have to stop the charge. Q: My NiMH or NiCad pack is very warm, and the charger is not cutting off. Why? A: You have likely set a charge rate below the fast charge rate on the pack's label. Folks, 'peak detection' control of charge termination at low charge rates (generally below 1 amp) can be very problematic for most types of NiCad or NiMH cells. The charger is looking for a pre-determined voltage drop on the pack to trigger charge termination. By ignoring the fast charge label rates and assuming you will be less likely to damage the pack with a conservative charge rate you may in fact wind up with the charger running considerably longer than necessary to charge the pack. At the low charge rate, particularly when charged via switch chargeports or when multiple connectors and long charge leads are in use the pack often won't reveal a clean voltage drop that the charger needs to see when they reach full charge.... temp builds up, cell vents open and the pack will be ruined. Read and apply the info on our pack labels.. if using peak detection charge control, set the charge rate at the rate recommended for fast charging. If slow charging with peak control, don't abandon the pack to the chargers brain... use yours. Check the pack periodically for temp rise and apply a time limit for the charge if the charger will allow one. Q: My Triton keeps cutting off with about 1000ma put into my NiMH 2700 pack. The pack is not warm, but the charger keeps shutting down. What's wrong with the pack? A: Wrong with the pack?? It's pretty doubtful this is a 'battery' problem. In this particular situation it's your Triton's Auto Presets. The charger, being 'smart;' sticks to it's programing parameters.. and the default 'auto' NiMH program for that particular charger has a value of 1000ma set in it's default maximum charge parameters for NiMH. See your charger manual (page 14, bottom of the page, item #8) for what's 'wrong' and re-program that function. BTW.. the 'smarter' the charger, the more you need to review and become familiar with it's programing structure, capabilities and 'decision making' parameters. In other words RTFM (read the freaking manual) and make sure you're 'smarter' than it is so you can correctly interpret what it's trying to tell you. Q: I’ve had a couple of packs fail after just a few seasons. How long do packs usually last? A: Cell type and technology, dimensioning, duty application stresses, charge rates, charger types and calendar age all impact directly pack performance and lifespan. As a rule of thumb, 2-3 seasons of normal use can be reasonably expected in most R/C applications, but bear in mind that some high capacity systems can fare worse than others under fast charge and high current demands. We recommend you check your packs with a cycler once or twice per season to keep tabs on it’s relative health and the use of an ESV every flight to avoid any unwanted battery surprises. For longest service life, use a slow charge routine for normal recharging.. charge till the pack is warm, no more. Use the peak charger only when necessary at the field to extend flying times. Don't peak charge NiMH Txpacks before the voltage display on the Tx drops below 9.6v.. constant 'peaking' of NiMH Tx packs ruins them pretty quickly. Q: I bought some packs about a year and a half back and put them on the shelf. The project got delayed and now, when I tried to form them, the capacity is much lower than the label says they should be. Is this normal? Do I need new packs? Is there any warranty... I never used them! A: There are two 'clocks' running on all battery types... duty cycles AND the calender. Nominal 'shelf' life for nicads is a bit better than NiMH, but both types will show significant capacity loss over a season or two, even if you don't 'use' them. I normally see losses running in the 10-15% range on capacity per year, sometimes more depending on the battery type. Some assembly shops buy cells in large quantities, this often leads to 'fresh' (to you) packs being built out of cells that are already a year or more old. We avoid that by buying from a high volume distributor in much lower quantities as we need them.. our cell inventory remains 'fresh' that way. Regarding buying new packs.. depending on what the application is, yep; that might be your best bet as I generally replace any pack of my own in a plane if it's capacity returns get much lower than 25% under the rated capacity for the pack when new.. if the pack is running the radio system. If it's an ignition or lighting pack, I'll debate myself on the issue and may elect to let it go another season. As in all situations, routine load checks between flights is how you stay out of trouble. Regarding warranty replacement for a year and a half old pack with low capacity numbers... nope. There's a 1 year workmanship/material warranty of all my Nicad and NiMH packs (unheard of elsewhere in the battery business)... however, there is NO warranty for capacity, lifespan, number or cycles, etc. Best advice.. buy packs when you are ready to use them, and run formation capacity checks as soon as practical to establish pack condition. If you have an under-performing NEW pack, I want to know and I will replace it if it's returned here for testing. Q: What’s an ‘ESV’ and why do I need one?? A: An ‘Expanded Scale Voltmeter’ as it relates to the hobby is a test device that combines a voltmeter with a load. When activated, it applies a pre-determined fixed load to the pack and displays what the voltage of the pack is while that load is applied. A meter without a load is just a voltmeter, and unloaded voltage is NOT the info needed to make a ‘fly’ or ‘don’t fly’ decision. We recommend the load be at least 250ma for 10 seconds on any Nicad or NiMH pack used in .60 sized and smaller aircraft and a 500ma load applied for 10 seconds for larger aircraft. We recommend a safe minimum ‘flyable’ voltage while the load is applied to be no less than 1.2v per cell, or 4.81v for a 4 cell pack and 6.01v for a 5 cell pack. Q: Ok, seems easy enough, but how often should I check my pack with an ESV?? A: Prior to every flight, including the first one. Most standard switches provided by the radio mfg’s do have a ‘charge lead’ plug and wire, but unless you add a ‘charge port’ for that lead in an accessible place on the outside of the plane you’ll likely not want to pull the plane apart to get at the plug. Either upgrade to a chargeport inclusive HD switch or add a $3.00 ‘charge port receptacle’ to your OEM switch’s charge lead to gain immediate access to the pack. Get in the habit of checking the pack before every flight. If you do, you’ll likely never lose a plane to an under performing or weak pack. Q: How do I find out how many flights I can safely fly with my pack? A: The answer is different for just about every application. Factors like how you fly, what servo's you have, what the temperature is and what the type pack and it's relative overall condition is will all impact the number of flights you can safely fly with a full charge. A battery cycler can establish what the capacity of the pack is, and your ESV checks will reveal when it’s no longer safe to fly. To determine the amount of energy required to fly your plane just fully charge the pack and fly two or three of your routine flights (while checking between flights with an ESV to stay safe) and record the amount of time flown. You can then return the pack directly to the cycler and record the capacity remaining. Subtract that from the normal capacity of the pack to get the amount of capacity your flights used. Next, just divide the amount of capacity used by the number of minutes flown and you have the average amount of capacity consumed per minute of operation. Q: Ok, now that I know how long I can fly my pack, why keep checking with my loaded ESV? A: The value of doing a loaded ESV test before every flight becomes even more apparent when the number of safe flights count begins to materially change. Lets say my 'Divit Digger .90' is getting to the safe minimum loaded voltage after 3 flights when just a few months previously it averaged 5 flights. The big question now becomes ‘What's changed.. and why?'. Time to re-charge and cycle the battery to see if the pack is aging and needs replacement or if the charger's the culprit. If the pack and charger check out ok, what on board the aircraft is pulling all that juice? Most often I find a servo problem, either stalling at full transit (throttle setup needs re-adjusting, fairly common) or a condition developed with servo gears or control system linkages. Point is, because you had a data point to start with you were able to detect a material operational change and head off a problem before it swallowed an airplane. Q: Are Nickel Metal Hydride packs better than Nicads? A: The answer depends on the application. NiMH in some cell types can have higher internal impedance, this means the voltage drop under significant current loads can be noticeable; particularly in electric flight motor pack applications. In most smaller sized aircraft (up to .60 sized using 'AA' sized cells) normal servo current loads seldom impact system security. Even in aerobatic environments most control systems don’t threaten a modern 4 cell Sanyo NiMH 'A' or 'Sub-C' sized packs voltage stability while under normal aerobatic flight loads. Nonetheless, I prefer to be very safe instead of very sorry! Years of experience with both Nicad and NiMH discharge curves under demanding or spiking, erratic loads leads me to strongly recommend using a 5 cell 6v pack or a parallel pack system in overly aggressive flight circumstances and particularly in 3-D, IMAC and Giant Scale type applications no matter which cell technology or servos you choose to fly with. As far as I'm aware, I'm the only assembler that puts the cell impedance value on every receiver pack we build... as well as the reccomended slow charge and fast charge rates. You'll also find the cell impedance ratings included with our pack specs here on the website and on our price sheets. Q: The ‘Old Salts’ all say I should stay away from NiMH, that they aren’t dependable. There has to be a reason why. What’s wrong with NiMH? A: Actually, the question really should be “What WAS wrong with NiMH?” Initially, NiMH claims commonly made were ‘More capacity and less weight than Nicad’. That was true then.. but the dependability suffered because the cell insulator materials were relatively fragile and the cell plates were pretty thin in order to keep the cells light. It turned out that ‘lighter’ wasn’t better, and when the cells were used in fast-charged commercial tooling applications significant shortfalls in duty cycle lifetimes and rapid capacity deterioration compared to Nicads became apparent. Luckily for us modelers, yet again, following the same development cycle as Nicads two decades ago, the demands of the portable power tool market has lead to the development of far more robust NiMH cells. The current genre of fast charge NiMH cells now sport thicker plates, better insulators and all welded internal assembly, features that reduced impedance and dramatically improved durability and duty cycle lifetimes in high load and fast charge applications. Today’s fast charge safe NiMH cells are no longer lighter than Nicads in the same physical dimensions but they do continue to offer significantly higher capacities when compared to Nicads of the same dimensions. Q: How about Impedance? Can NiMH cells handle the loads from digital servos in big planes?? A: High impedance isn't native to NiMH cells.. there are more than a few Nicad cells with impedance just as high as a comparable NiMH cell. Most folks react to the 'capacity' number as being the big part of their decision in selecting a pack for their big aggressive birds. This can lead to big trouble on board the aircraft. This is why you'll find we won't sell some AA NiMH cell types for receiver & servo applications that we do provide for Tx applications. Our new 4/5 'A' 1950FAUP NiMH Sanyo Rx pack has the same impedance as a 1700 Sub C Nicad, so impedance by itself in NiMH doesn't mean you can't use them, it just means you need to be sure the cell type is appropriate for the job you expect it to do. Smaller aircraft do just fine on AA sized NiMH packs, big birds should use 'A' sized or larger Nicad or NiMH cells (and in some cases parallel setups or 5 cell packs rather than 4 cell packs) to stay ahead of the voltage drops under load associated with higher impedance cells. Some of our most often asked questions deal with the practicality of using two packs. I find it incredible that there are still wives tales circulating about the practice of using packs in parallel… we’ll deal with the myth and reality, and have a look at WHY you might want to use a parallel / redundant system. Q: What do I ‘get’ if I use two packs? · Reduced system voltage drop under a load due to an effective 50% reduction in system impedance. This means the system voltage will be higher under a given load with TWO packs instead of one. This is an exceptionally desireable advantage in an agressive aerobatic aircraft! · No single switch, pack or connector failure can kill the plane..
· Flight time is increased by the additional capacity of the second pack. Q: Gramp’s sez “There ain’t no such thing as a free lunch”.. there has to be drawbacks. What are they? A: Gramp’s may be right about lunch, there’s always a cost… Obviously, the second pack adds weight, but we’re getting the benefit of a significant increase in flying time for that extra weight. The ‘free lunch’ part comes with the greatly improved voltage performance under load and the ‘insurance’ provided by the redundant pack, switch and wiring. Q: Ok, that’s pretty kewl.. but my instructor sez I need diode protection or the packs will cross-talk or try to charge each other. A: Sorry.. your instructor has been gaffed by Under-Informed Magazine Columists or the Battery Mis-Information Committee of your local fields Wives Tale Tag Team. There is NO need for diodes or a 'backup' circuit board (something else that adds weight, complexity and another possible failure point) and in fact there's no flight-safety significant energy transfer between packs at different charge levels. You can test this yourself.. just plug a discharged pack and a fully charged pack together in a Y-Harness and check the two packs the next day.. You’ll find the system will pass a load test if checked through the ‘Y’, and you’ll also find that less than 20% of the charged packs energy has been ‘used’ by the discharged pack when you separately cycle-test the two of them. Next, consider that your average flight is 10-12 minutes, not 24 hours! The mythical "Energy Transfer Between Packs" scenario is simply NOT a flight safety issue and checking both packs before flight with a loaded ESV will certainly 'pick up' a weak pack before you fly it anyway! Q: Can I run packs of different size in parallel? A: Yes.. if by size you mean ‘capacity’. Remember; battery packs are rated in three ways.. capacity, impedance and voltage. In a parallel system the number of cells in the 2 packs should be the same, and we recommend you use packs with similar impedance ratings but the capacity (milliamps) rating can be different. Q: How do I charge them? A: Here we pay some more for the lunch… the two packs MUST be charged separately. Knowing that is half the battle though. New field charging systems with dual port outputs like the Hobbico MKII and the Accucycle Elite make charging two packs no more time consuming or difficult than charging one. Care should be taken though when charging 2 packs at the same time. Reported premature charger cutoffs and erratic false peaks have been reported due to the 'common ground' shared by the packs through the connection at the Rx. This condition crops up commonly because most high-end switches have a DSC circuit. To avoid this, just unplug one of the switches from the Rx before starting the charge, this breaks the 'common ground' link between the packs during the charge routine. When your done, just plug the disconnected switch back into the Rx and do your load tests. Q: What kind of switches should I use? A: An excellent solution is a pair of HD ‘Chargeport’ equipped switches like our EDI Ultra Switches with built in charge ports. These extremely reliable 'one hole' dual throw - quad contact HD switches make it quite easy to check and charge each pack directly though it’s own port and keeps the wiring to a minimum. To check the system, use a loaded ESV on each pack through it's own chargeport. Then switch one system off, jog the sticks. If all is good, shut the first switch down, turn the other on and do the stick wiggle again. Then switch both on and fly. Q: Ok, but my Rx only has one 'Battery' port.. where do I plug in the second switch?? A: You can use ANY open servo port (channel) on your Rx to plug in the second switch. If all the ports on your Rx are occupied, just use a HD 'Y' Harness plugged into a low-use servo port (ex: retracts, choke or smoke) to retain the maximum benefit of redundancy. About 10 years ago I started advocating the use of dual switches fed by two leads on a single 5-cell pack as an alternative to running a heavier parallel / redundant pack system. Recently, I’ve been fielding more and more questions regarding this practice. Q: What’s the advantage of adding a second lead to a battery pack? A: Normally, you’d only add a second lead to your pack if you intended to add a second switch. Doing so reduces the net voltage drop in the system under load (essentially the same as using much heavier gauge wiring) and the redundant connectors and switch prevents a catastrophic loss due to a single connector or switch failure. Q: Isn’t the pack the most likely thing to fail on the airplane? Why back up the switches? A: Whups.. looks like the Wives Tale Tag Team has been busy again. The likelihood of a tested, known to be in good condition and properly charged pack suddenly suffering a cell failure in flight is unlikely. Falling short of a castatrophic weld or cell interconnect casualty the two components on the aircraft most likely to fail during flight operations are the connectors or the switch assembly; both items being very susceptible to vibration and fuel soaking damage leading to an ‘intermittent’ operating condition.. something that’s insidiously difficult to detect before it costs you a plane. Q: What can I do to protect myself against the ‘unlikely’ event of a cell failure? A: Cells typically fail ‘shorted’.. that means that falling short of a major mechanical failure of the battery pack cell interconnects (why you should NEVER fly a ‘soldered’ pack), electrical continuity of the system remains intact.. in other words, if a cell shorts out, the system voltage drops by the value of the failed cell. To avoid allowing the voltage drop of a failed cell to threaten the system, just use a 5-cell pack instead of a 4-cell pack. To avoid the remote possibility of a weld or battery interconnect strap failure, using parallel packs does the trick & covers all the bases. Q What’s the safest.. dual leads on a single pack or dual packs? A: The safest system in the air is a matched parallel / redundant 5-cell Rx pack system. As well as backing up the vulnerable switch and connector it also avoids the remote possibility of a shorted cell, weld or battery interconnect strap failure in one of the packs taking you down out of hand.. parallel systems cover all the bases. The next best setup is a single 5-cell pack with dual leads and dual switches. The latter is lighter by the weight of one pack, the former a lot better for handling very large current draw. Both are far, far better than a single 4-cell pack in ANY application. Q: What’s the best switch setup for a single 5 cell pack? A: You can save a bit on weight by using two HD ‘standard’ type switches with charge leads and then add one ‘Earnst’ type charge port to get ESV and charger access to the pack. Alternatively, you can use two of the larger ‘chargeport’ type switches, this allows you to plug your ESV in to watch your voltage while the charger is plugged into the other port. If you were not counting grams, this would be a better route. Q: What’s up with 5 cell packs.. why would I need one? A: Both Nicads and NiMH have similar load performance.. when a load is applied the voltage drops. The bigger the load, the bigger the voltage drop. If you are flying an average 40-60 sized trainer or sport aerobatic plane, voltage drops are fairly low because the control surface loading isn’t significantly loading up the servos. As soon as the planes get a little bigger, folks need bigger servo’s to deal with the bigger control surface loads.. before long we reach a ‘critical load point’ where the loaded voltage drop on a half discharged 4 cell pack could force the systems voltage down to less than 4.4v.. the voltage point where no sane man want’s to fly because some brands of receivers tend to stop receiving around there. This leads to the famous ‘I ain’t got it!! !’ demise of another nice plane because the Rx stopped working due to a servo load Rx lockout. Q: What kinds of planes need 5 cell packs, or; how will I know if I need a 5 cell pack without crashing first? A: Well, it ain’t quite as bad as all that; folks have been flying with happy smiles for several decades on 4 cell packs; and certainly not everybody needs one. On the other hand, ‘standard size’ 120oz pack draining high torque servo’s haven’t been around for decades. Ever more apparent the past couple of years are aircraft and control systems that ‘ol Gramps and his Kaydett would hardly recognize. The demands of modern aircraft designs with massive control surfaces tied to ultra high speed, high torque servos forces a better, higher capacity, higher voltage pack to keep up with the higher loads without the risk of tripping over the minimum voltage the receiver needs to keep you flying. Pattern Planes, Giant Scale, Aerobatic, Heli’s, 3-D’ers and anybody else that wants faster control response and more servo output power should be using a 5 cell 6 volt Rx pack. Q: If I use a 5 cell NiMH pack do I need to use a voltage regulator? A: In far and away the majority of R/C Rx applications a 6v NiMH pack provides the same faster servo speed and increased servo output power a 6v Nicad would without any of the twitches or jitters long associated with Nicad 6v systems. Nicads display a relatively high ‘surface voltage spike’ fresh off of a peak charge, and that’s what’s producing those un-nerving servo jitters. With a NiMH pack the peak voltage spike fresh off of a fast charge is dampened better, result; you’ll rarely get those annoying shakes and quakes that require a voltage regulator or 'pre-loading' with an ESV to avoid. Q: I’d like to upgrade my computer radio systems Tx pack. Can I use NiMH packs? 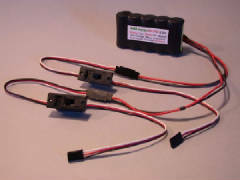 A: Quality NoBS Sanyo NiMH replacement packs and Computer R/C Transmitters are perfect for each other. The original equipment 700ma Nicad pack in my Futaba 9CAP would peter out in under an hour of operation. With a new NoBS Sanyo NiMH 1650ma replacement the run time is better than twice that; even more when I’m not in PCM mode (4 + hours in PPM!). Q: My planes spend the winter in an unheated garage.. and it gets awful cold here. What is the best way to store my Nicad & NiMH packs for winter? A: I normally fully charge the pack, then cycle it for a capacity check, record the info and then recharge it fully before I put it away for the winter. I store my packs in areas that won’t freeze, batteries like the same temps you do so, in your case; you should certainly take the packs out of the planes and bring 'em in where it's warmer. In the spring, I discharge it and record the capacity return to see what it lost over the winter, then re-charge and cycle again to compare the full/fresh charge capacity return with the return I got from the capacity check I made before I put it away. If it retained around half or more of it’s capacity during storage and returns to a capacity level in the spring charge/cycle test that compares to within 15% of the ‘fall’ test I’ll go ahead and put it back in the plane. Over three seasons old, regardless of test results, I replace ‘em. Q: Can I use my standard radio system wall charger to charge my new NiMH packs? A: NiMH and Nicads share the same basic slow charge requirements.. @ 10% of rated capacity for 14 to 16 hours. Usually, when you upgrade your radio systems packs to NiMH you’ve significantly increased the battery capacity so charge time will go up also. In most cases, your upgraded NiMH pack can be supported with your OEM charger. Remember to take ithe Transmitter off the charger when the pack warms up, DON'T leave it on indefinitely as this will certainly shorten the life of the pack. Charge till the pack warms up, then stop the charge. Q: Can I safely fast charge NiMH Rx and Tx packs? A: You bet, providing the charger MFG’s documentation clearly indicates the peak charge algorithm is appropriate for NiMH packs. Some examples of NiMH safe fast chargers are the current model Multiplex, Hobbico, AstroFlight and the Trition Charger from Great Planes. Programmable Digital Charger / Cyclers generally range in price from $80-150..** but will be able to form charge, fast charge, cycle test and display the capacity info for any battery type your likely to encounter in the hobby. Normally, fast charging of NiMH packs is done at the 1C charge rate. (1000ma pack = 1 amp charge rate) Cell type and impedance can impact the '1C' rule, normally we recomend a maximum fast charge rate of 1.0 to 1.5 amps on all the High Capacity Sanyo AA Tx packs and cells.. significantly less than the 1C rate. All our packs come with the recomended slow and fast charge rates right on the pack label. ** An excellent example of a modern programmable Charger / Cycler at the lower end of the price scale is our Multiplex LN-5014, which will charge 1-14 cell packs of NiMH or Nicads in 100ma increments up through 5 amps, will support correctly Li-Poly or Li-Ion packs up to 4 cells at 4 amps, charge your 12v lead acid or gell field battery, form-cycle 'em up to 5 times automaticaly AND display capacity and voltage data... one simple charger to do it all at the field or on the bench for about $85 bucks. Q: Are NiMH packs an appropriate choice for Giant Scale applications? A: Certainly! Modern QUALITY NiMH packs are every bit as durable and reliable as any Nicad system. Since their internal impedence in some types can be a stumbling block, using a 5 cell system can overcome the voltage drop associated with bigger bird servo loading. Just as with Nicads, you should select a low impedance cell for your Giant Scale Warbirds and IMAC planes. It certainly would be appropriate to use a 5 cell, 6v arrangement to more safely accommodate the higher control surface flight loads while providing additional servo power and improve transit speeds and Rx voltage security. Q: How about Li-Ion Rx packs for my IMAC plane.. any advantages? A: 'There must be SOME advantage.. after all, some of the best fliers in the country are using them!' I get this one more often than not.. and it deserves an answer that's outside the scope of this FAQ. Check the navbar to the left for a link to the IMAC Li-Ion vs Nicad and NiMH debate hashed out in detail plus an item by item comparison of three IMAC systems and their relative merits. Enjoy! Q: Can I run NiMH packs in parallel? A: Sure! Just as with Nicads, NiMH packs can be placed into duty cycles wired in parallel as long as they are of the same voltage. However; they need to be charged separately!! Charging in parallel could quite easily damage the cells or worse. Never charge Nicads or NiMH packs in Parallel! 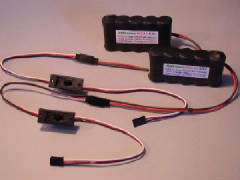 Q: If I use NiMH packs, will I need a battery back up system? A: Not unless you ‘needed’ one with your Nicad setup. Normally, using “battery back-ups” means using parallel packs. You'll need to keep the packs separated for charging and there's always the additional weight to consider, but you get a significant gain in runtime and a whole lot more system security. To keep weight down, you can use a single 5 cell pack with two connector leads fed to two switches to ‘back up’ the radio systems higher risk components.. Intermittent switches and momentary connector issues kill far more airplanes than cell failures in flight. The best back-up system going, even with today’s hi-tech gizmo oriented on-board power hungry ‘save me from myself’ gadgetry, is a pilot that plugs his trusty ESV into the plane load tests his pack before each and every flight. Q: What’s the expected lifetime of NiMH packs vs Nicad packs? A: Not all cells are created ‘equal’ There are a number of suppliers in the market providing NiMH and Nicad packs for very inexpensive prices. Most of these cells are Chinese in origin and the standards of manufacture can be pretty dismal resulting in poor performance under load, poor reliability and significantly reduced duty cycle lifetimes. You need to know what you are buying if your concerned about quality AND price. Overall, comparable quality NiMH and Nicad cells offer essentially the same life expectancy in the hobby enviornment (2-3 seasons; sometimes less for ultra hi-capacity AA systems). I recommend you use only high quality cells from reputable manufacturers in R/C applications and replace your packs every two to three years regardless of whether you use Nicad or NiMH. Q: Aren’t all NiMH and Nicad packs pretty much the same as yours?A: Perish the thought! NO!! We use ONLY SANYO, KAN and GP first line top quality NiMH & Nicad cells in constructing our Rx & Tx packs.. and we screen them for defects before assembly. We NEVER use cells of indifferent quality from some cheezy third world source, machine mass produced & glue gunned into poor quality unmatched packs with weak inadequate cell connections, wired with cheap connectors and wrapped in fragile, brittle plastic shrink wrap! No! I wouldn’t put one of those in my plane, and I sure wouldn’t recommend ‘em to anybody else. No matter WHAT pack or technology you choose, I strongly urge you to purchase your packs from a reputable US based assembler that specializes in mil-spec assembly techniques using top quality Sanyo products.Q: All this sounds good.. but I’ve never heard of NoBS Batteries. Who are you guys? A: NoBS stands for NO BULL in providing you with straight answers to the key questions regarding who’s cells and what types are being used in your pack. If you have a NoBS pack, just check the battery pack label for the source cell manufacturer, type and the cell model number. It’s no secret that Sanyo is the industry’s best and most reliable rechargeable cell manufacturer. If your model matters, then whose cells are in your pack matters. It’s as simple, and as important, as that. Bear in mind I’ve been a modeler for over 40 years & spent better than a decade as the Operations and Production Manager with the industry’s premier battery pack assembler before starting up NoBS Batteries. I’ve brought into my new company the same high quality mil-spec assembly and finishing techniques I used there to provide dependable operation and durability in the demanding R/C environment. Features like strong rubberized and pliable Rx pack shrink finishing, 22 & 18 gauge wiring, strain relieved solder connections and gold plated OEM quality connectors are standard on every on board Rx and Ignition Pack. These packs are the best you can get.. No BS! Q: Some assemblers prices are more than twice as high as yours! If your packs are as good as theirs how come yours costs so much less? A: It’s all about scaling and overhead. Since I’m a direct seller, I can operate on a significantly smaller scale with dramatically reduced overhead and pass the operational savings along to you. Since NoBS Batteries does not run glitzy full page national advertising campaigns, staff a marketing division or a ‘front office’, we can offer the modeling community exceptionally high quality mil-spec R/C packs assembled from cells that come from the same sources the ‘big guns’ use. Here at NoBS we never re-jacket cells to disguise the origin or date coding. Our NoBS packs are the finest quality packs available anywhere, assembled for about half the price you’d pay for comparable packs from any other source of comparable quality. And, there’s no annoying ‘BS’ about who’s cells we use; ever. With a NoBS pack you’ll always get top quality cells with a pedigree, assembled by an experienced industry expert highly skilled in the craft of reliable battery assembly. We’re all about providing the finest quality R/C packs available, at prices we can all afford. No BS.. Just GREAT battery packs, guaranteed. I'm constantly adding to and updating this FAQ.. if you have a relevant question or comment PLEASE email it to me! I'll get your reply out ASAP and if it's relevant to this FAQ ; I'll add it here. Thanks so much to all of you that have contributed to this page already!